I found a great new recipe I just needed to share. I was looking for something a little different but still easy for our family Mother’s Day dinner. This recipe was a big hit. If you like apple pie, you should give it a try. Serve it room temperature or warm, plain or topped with vanilla ice cream. I think it got a little too sweet for me leftover, so for best results, make it the day you plan to serve it. Preferably pulling it out of the oven so you can serve it warm. 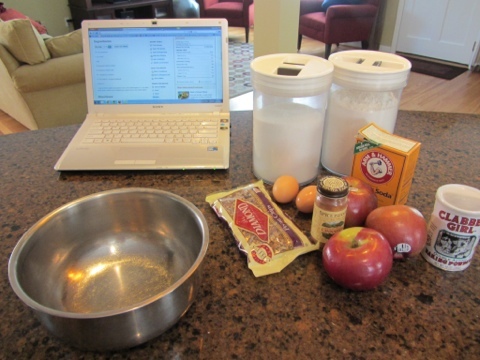 I always prep by taking out all of the ingredients and putting them on my kitchen island next to my laptop with the recipe pulled up. As I use ingredients, I move them from one side of the island to the other, ensuring that I never forget to add an ingredient accidentally. This doesn’t take long to mix up, so go ahead and start preheating the oven to 350º. If you use stick butter like I do rather than tub margarine, you need to soften it up before starting. You could pull it out of the fridge for a bit before you start, but I never plan that far in advance. Instead, I put it in the microwave for 30 seconds or so…adding a little time as needed so that the butter is soft but not melted. Place the softened butter and sugar into a bowl. 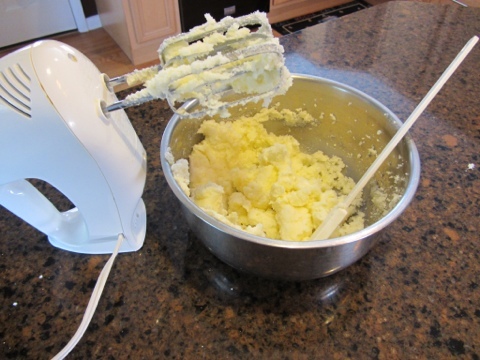 Using an electric beater, give it a whir until the sugar is incorporated into the butter. 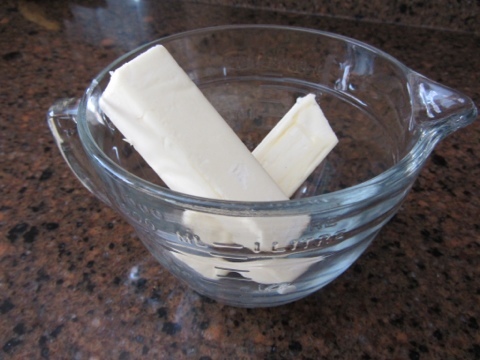 The butter will get stuck in the beaters…use your fingers to push most of it back into the bowl. The next step is to add the eggs to the butter/sugar and beat until incorporated. The picture above shows how it looks after you’ve added the eggs. Next add the baking powder, baking soda, cinnamon & 1/2 of the flour to the bowl. On low, beat the mixture again until you can’t see any dry ingredients. Then add the rest of the flour and beat until you have a nice batter mixture…don’t over beat…stop as soon as you see all of the flour is mixed in. Use a scrapper to get everything off the of the sides of the bowls and use your fingers to get as much of the batter off of the beaters and back into the bowl. Now you are ready to peel & chop your apples. 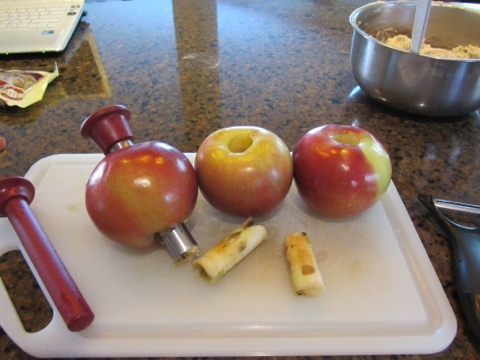 I use an apple corer. Just push the hollow metal portion of the corer through the stem. Pull it out and use the other piece (mine is the red thing on the left side of the picture above) to push the core out of the metal. After I’ve cored the apples, I use a peeler. I’ve found it is a lot faster to peel a cored apple than to do it first. 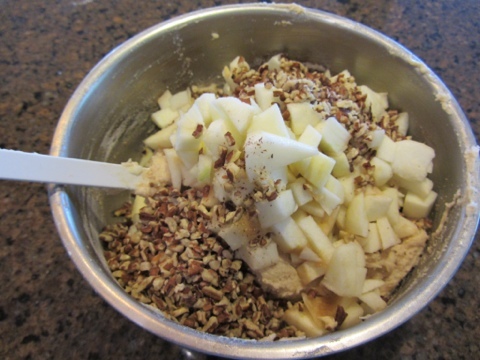 Once the apples are peeled & cored, cut them into quarters and them chop them into small pieces. You can decide if you want big chunks or diced apple. 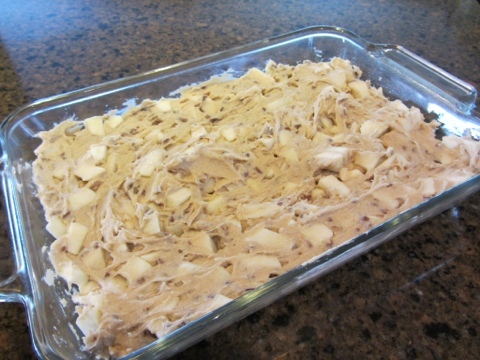 Add the nuts and apple to the batter and give it a good stir. Then pour the batter into a 9 x 13 baking dish that has been sprayed with cooking spray. I like using a glass dish since I can use it as a serving dish. If you use a metal pan, you might need to adjust the cooking time a bit. 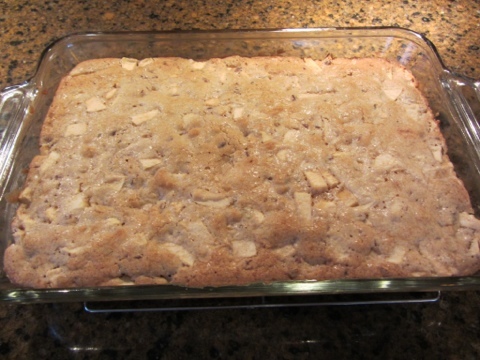 Bake for 35 minutes or until the top is slightly browned and a toothpick comes out clean in the center.